— Submitted photo The medium sized Lure Lock tacklebox from Tak Logic. Notice how nicely the jigging spoons are displayed, and they don’t move or rattle around. The Lure Lock is a nice new addition to my fishing equipment. It’s the second week of April and we just got dumped on with snow again. And the lakes are still iced-over. I spoke with a friend yesterday who keeps a journal of his outdoor experiences. On April 4, 2017, he was in a boat fishing for crappies on his home waters in central Minnesota. On April 4, 2018, there was still 30 inches of ice on that same lake. Another friend, a retailer of fishing tackle in north Iowa, said the ice was already three weeks late in going out. I still can’t open water fish, and I’m not going out on the ice, and I’m don’t have the time to make a trip to somewhere that has open water. So I’m going to look through my gear and plan for that first open water trip. Here’s what I’m seeing as far as gear, and also what I’m planning. Trolling or casting crankbaits is an outstanding way to catch walleyes. I would guess that four out of five of my biggest walleyes have come on crankbaits. For a while now, we’ve been pulling a lot of the newer Strike King walleye crankbaits. 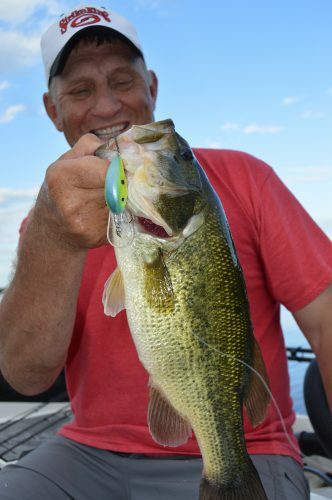 Strike King is best known for producing some of the best bass baits in the world, but when the word really gets out about their walleye crankbaits, look out. The bulk of my experience is with the Lucky Shad model, but they also make a crankbait called the Banana Shad, and another named the Bonsai Shad. All have different actions and sizes, and action and size can be a big deal. 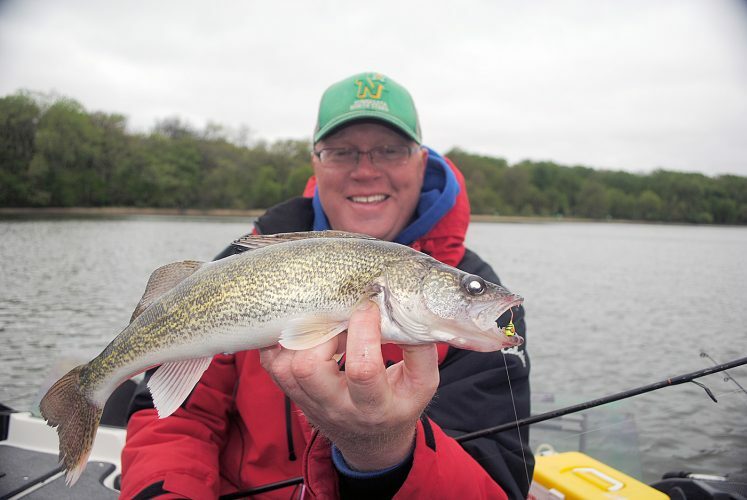 There are times when walleyes show a strong preference for smaller cranks, such as in the spring, and later in the year larger baits are preferred. Same thing with lure action: Sometimes a wider wobble is preferred, other times a tighter action is better. I’m looking forward to learning more about this new style of crankbait from Strike King. I’m also looking forward to storing these baits differently than in the past. Last year I had the opportunity to store my ice-fishing jigging spoons in a tacklebox from a new company. This tacklebox has a sticky base, and that sticky base kept my spoons from tangling and rattling, and also displayed them better so I could quickly locate the bait that I wanted to use. And, if the tacklebox should get tipped, the baits stayed right in place. 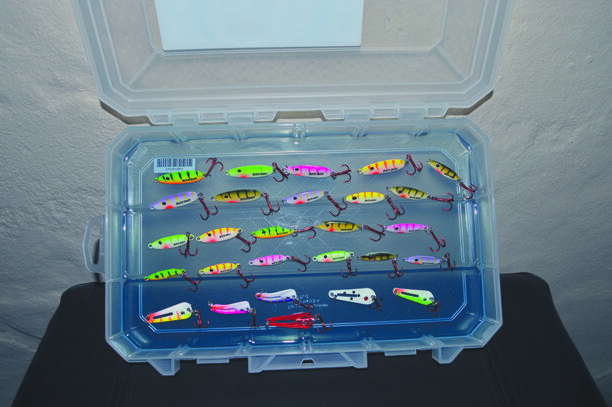 This new style of tacklebox is called a Lure Lock and is produced by a new company called Tak Logic. They come in three sizes and you need to check them out. Last thing: Sonar has come so far in the last few years. Today, it truly is possible to see individual fish and rocks and logs: It’s hard for the fish to hide, but we still have to make them bite. I’ve been using Raymarine sonar for several years now, and the more I use these units, the more I learn about locating and catching fish. These units perform so many different tasks, and they come in models that will appeal to anglers/boaters of all skill-levels. Raymarine is the standard in deep water fishing, but they produce sonar that is as good as any inland angler needs as well. My first fishing trip will probably be to Clear Lake in north central Iowa. 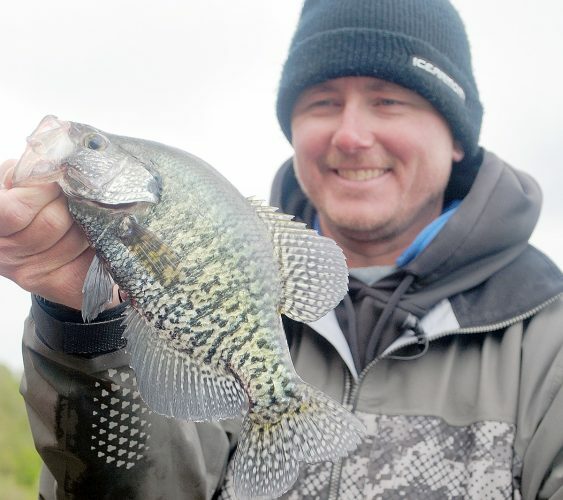 Clear Lake has become one of the Midwest’s premier multi-specie fisheries. I’m also looking forward to my annual trip to Lake Kabetogama in northern Minnesota. Kab is a world-class walleye and smallmouth bass fishery. But until Winter 2018 lets go, I’ve got more fishing equipment to look through and more planning to do, and for me, that’s another fun part of the fishing experience.